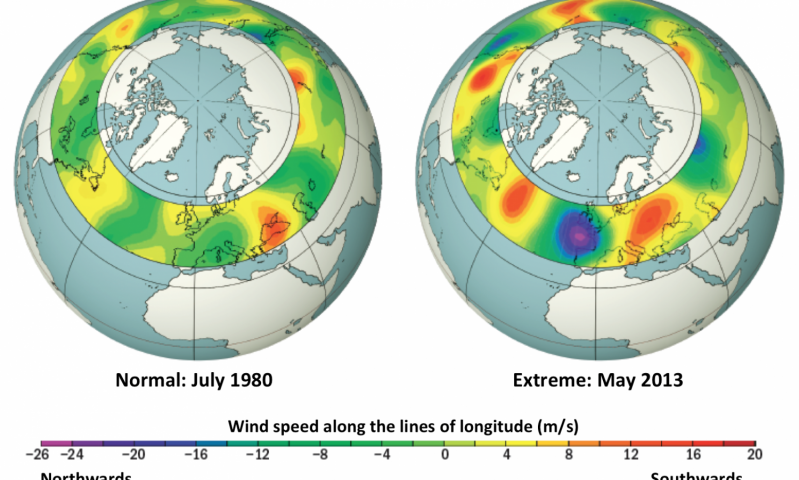 Unprecedented summer warmth and flooding, forest fires, drought and torrential rain—extreme weather events are occurring more and more often, but now an international team of climate scientists has found a connection between many extreme weather events and the impact climate change is having on the jet stream. This constrained configuration of the jet stream is like a rollercoaster with high peaks and valleys, but only forms when there are six, seven or eight pairs of peaks and valleys surrounding the globe. The jet stream can then behave as if there is a waveguide—uncrossable barriers in the north and south—and a wave with large peaks and valleys can occur. “We don’t trust climate models yet to predict specific episodes of extreme weather because the models are too coarse,” said study co-author Dim Coumou of PIK. “However, the models do faithfully reproduce large scale patterns of temperature change,” added co-author Kai Kornhuber of PIK.